I joined my friend Bryan Wilkins and his friend Bryan O. on a winter camping trip in an area in the hills above Boise. The area is called Banner Ridge, and it has many miles of groomed cross country ski trails. It is on the ridge between Idaho City and the town of Lowman. We headed up the trail pulling sleds with our gear, and quickly were on top of the ridge from the car, at about 2 miles. The ridge is open and flat topped, with incredible views of the surrounding area. 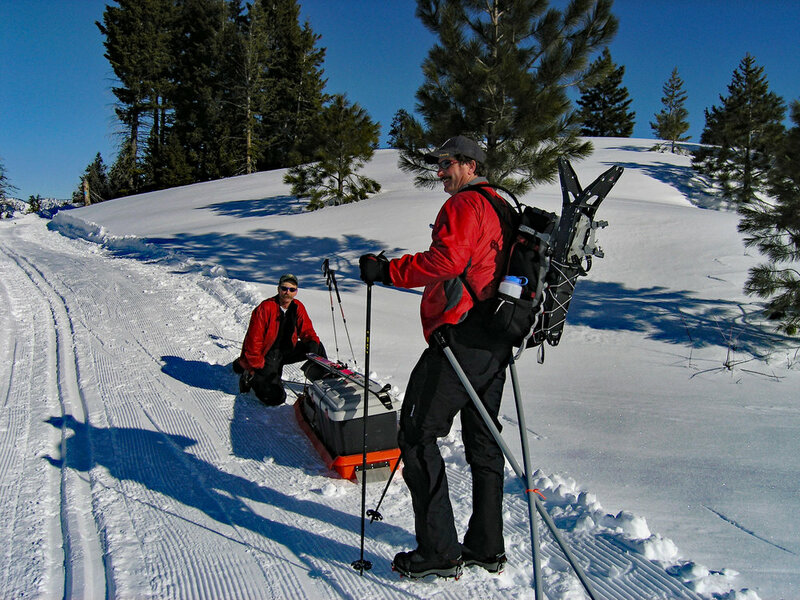 On relatively flat terrain its super convenient to use gear sleds. You can haul a lot more than you can pack on your back, and with no weight on your back pulling the sled is no problem at all. If the terrain is so angled that the sled rolls to one side, then sleds don't work so well. Once we got on top of the ridge we left the trail to a clearing in the trees not far from the trail, and began building snow shelters. We each made separate shelters of the type called "covered trench." I have been a bit nervous in closed spaces for the past few years, so my shelter had an open entrance and my head was right at the door. We started by stomping down areas for our shelters, then cutting blocks out of a trench with snow saws. Once the trench was cut, we formed the blocks into a peaked roof. After the roof was up we cut back the sidewalls to widen out the trench in a flare that widened towards the ground. Inside the trench we placed a plastic tarp, a foam pad and our sleeping bag. I also had a candle lantern, and a thermometer with a probe that extended outside the shelter so I could see how cold it was outside. Our cooking was at a little bench where we sat on foam sitting pads, with a foam foot pad, with a kitchen table in front of us. 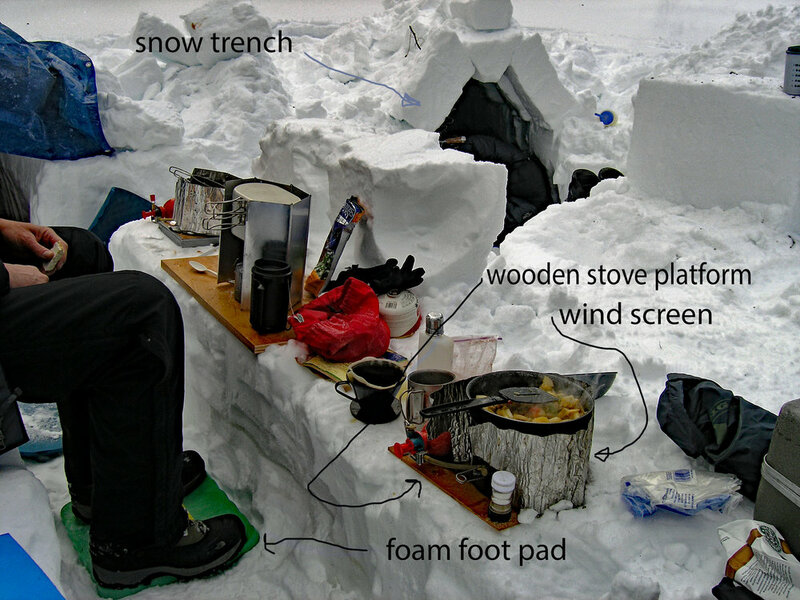 Making a comfortable kitchen set up is important in winter camping, with some features being a sitting bench in front of the stove area. The stove is on a thin plywood piece, so the stove doesn't sink into the snow. Gasoline stoves work well in the winter and put out a lot of heat to melt snow. Canisters stoves are hard to start when its cold, so people often warm the canister in sleeping bag or coat before starting the stove. Alcohol stoves work fine in the cold, but don't put out enough heat to be a serious snow melter. It got down to 5 degrees F. and I was just fine in my warm sleeping bag, a Western Mountaineering 0 degree down bag. It had so much loft it just about filled the one man trench I had built. Of course I put a plastic tarp down on the floor of the trench, and using both a foam pad and an inflatable pad are a good idea. I had a bad dream that featured my two worst fears. I dreamed of being in an enclosed space with my ex-wife, and she wouldn't stop talking. That woke me up at about 1:30 AM, and the whole area was bathed in moon light. Bryan O. had freeze dried eggs for breakfast, and Bryan W. had canned corn beef hash. He said that as he ate it he could feel his body temperature start to rise, from the fats and calories in it. They both looked on enviously as I started frying up my frozen Jimmy Dean hash, with potato chunks, peppers, onions and sausage pieces. When it was about done I added 3 eggs, and it was looking pretty good. Bryan W. read the ingredients onthe package to find out some reason why it was unhealthy, but couldn't really find any bad things in it, and I didn't care anyway because it tasted so good. There are two yurts located on or near the ridge top. They are operated by the Parks and Rec department, and anyone can book either yurt and stay there overnight year round. This looks like a fun way to spend a weekend in the mountains in the winter.